On average, July is the hottest month in Washington, D.C. Excessive heat can lead to sunburn, cramps, heat exhaustion and heat stroke. If you live on, work or visit Capitol Hill, stay alert for signs that you, a colleague or a loved one is too hot. 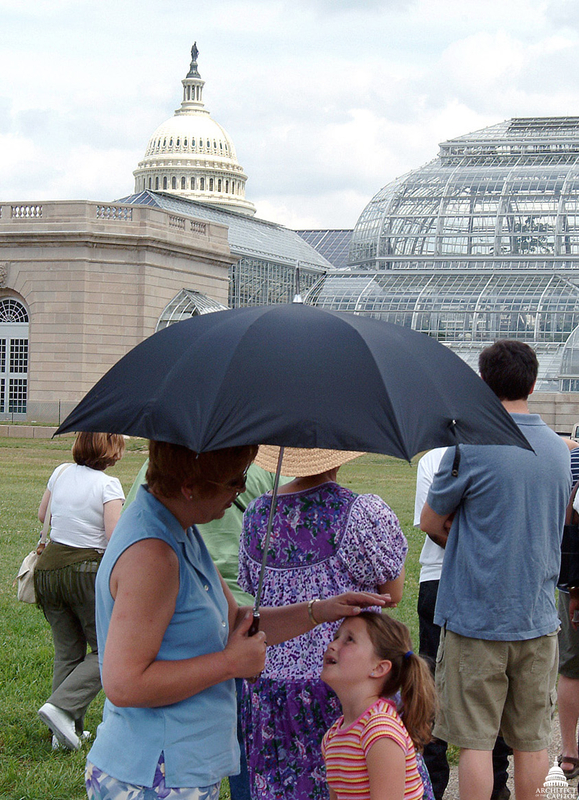 Visitors shade themselves from the summer sun with an umbrella. Symptoms of a heat-related illness include heavy sweating, weakness or fatigue, dizziness or confusion, nausea, clammy moist skin, pale or flushed complexion, muscle cramps, elevated body temperature and fast and shallow breathing. The hexagon-shaped Summerhouse located on the West Front lawn offers seating and drinking fountains. If someone is exhibiting these signs, have the individual immediately rest in a cool, shaded or air conditioned area and have the person slowly drink water. 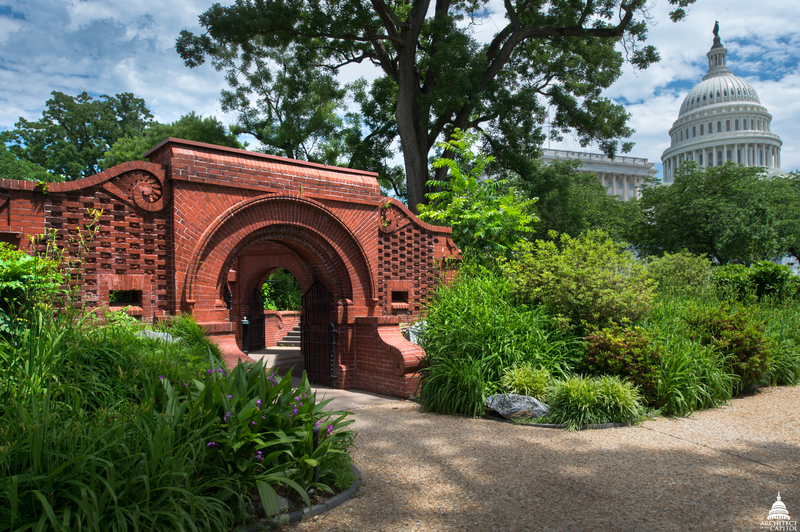 Office buildings and other facilities on campus provide air conditioning but don't forget that the Summerhouse, on the West Front Lawn of the U.S. Capitol, offers fresh water and a place to sit on Capitol Grounds. Visitors to Capitol Grounds rest beneath a Willow Oak tree. Shade trees also offer a reprieve from the summer sun. U.S. Capitol landscape architect Frederick Law Olmsted designed trees to provide shade for visitors. 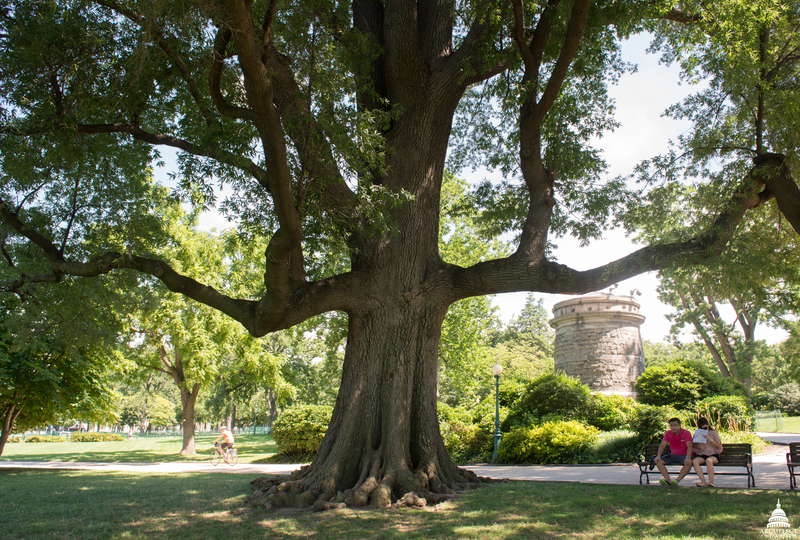 Olmsted used large, native trees for prominent entrance avenues and walkways. Deciduous species, such as elms, lindens, buckeyes and oaks, were commonly chosen – and are still the most prevalent species on the grounds. 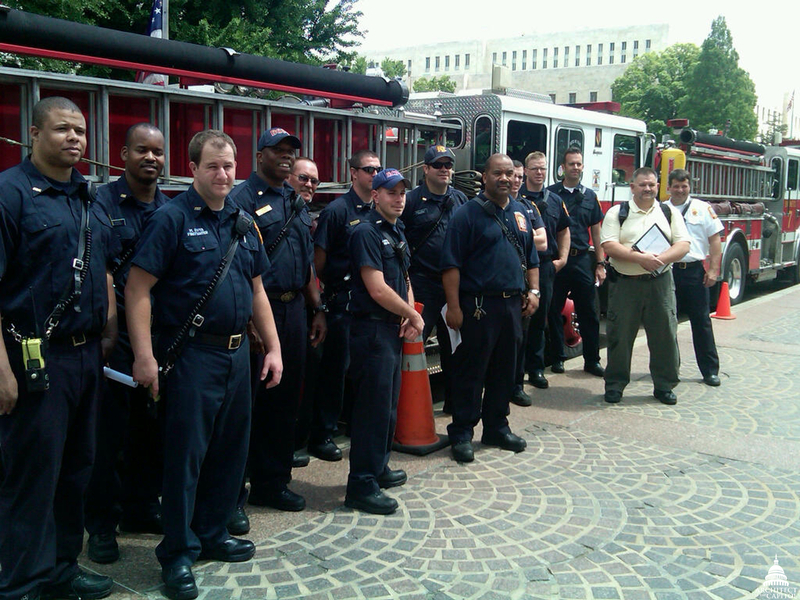 DC Fire and Emergency personnel on the Capitol campus. If you see something, say something! Just recognizing symptoms and asking, "are you OK, you don't look like yourself?" may be just enough to prevent someone from becoming dangerously ill.
Should heat exposure symptoms worsen, including vomiting, changes in consciousness, or exhibiting red skin or a high body temperature, call 9-1-1 for professional help. Be aware of the warning signs and take basic precautions to help keep everyone safe this summer. Burl Keller is a Supervisory Safety Engineer in the Architect of the Capitol's Office of Safety, Fire and Environmental Programs.